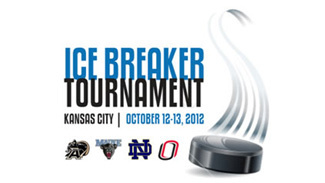 The 16th Ice Breaker Tournament at the Sprint Center in Kansas City, Mo., will officially ring in the 2012-13 collegiate ice hockey season on Oct. 12-13. The two-day event features four teams -- Army, Notre Dame, the University of Maine and the University of Nebraska-Omaha. This year's tournament will be the fourth for Maine, third for Notre Dame and Nebraska-Omaha, and the second for Army. According to the most recent U.S. College Hockey poll, two of the four teams are ranked among the top 20 -- No. 14 Notre Dame and No. 15 Maine. All the schools have won titles in their respective conferences. "We are extremely excited to be invited to college hockey's premier showcase," Notre Dame coach Jeff Jackson said in a statement. "We look forward to opening the 2012-13 season in a great hockey city and in an NHL-caliber building like Sprint Center. Hockey fans in Kansas City will definitely be entertained with some great college hockey from four great programs." One player who will be in the crosshairs of those NHL scouts in attendance will be 2013 draft eligible left wing Will Merchant, a freshman at Maine. The 6-foot, 172-pound forward impressed many as a free agent invitee to the Minnesota Wild's development camp in July. He also participated in the CCM/USA All-American Prospects Game in Buffalo on Sept. 29. "I was surprised he wasn't drafted last June," NHL Central Scouting's David Gregory told NHL.com. "I thought he'd be a nice late-round addition. He needs to show scouts that he can take the next step. Oftentimes, a player overlooked will suddenly get it the next year and teams see that and then give him a shot." Merchant produced 25 goals and 52 points in 2011-12 as a senior for Eagan High (Minn.), which finished 25-5-1 last season. The Wildcats won the South Suburban Conference and Section 3AA championship, and finished sixth in the Minnesota state tournament. He was a finalist for the prestigious Mr. Hockey Award, given to the top high school hockey player in the state of Minnesota. Last year, Boston College started its NCAA championship season by capturing the Ice Breaker championship at Ralph Engelstad Arena in Grand Forks, N.D. It marked the second time in four years that the champion of the Ice Breaker would capture the national title. In 2008, Boston University won the Ice Breaker at their home rink before going on to win the 2009 national title. All games in the tournament will be televised on the NBC Sports Network, with the exception of the third-place game. The championship team will win a trophy and an All-Tournament Team is announced at the conclusion of the event.